I love painting! Yup, it’s true. It’s a feeling of real POWER to transform a space in the matter of hours with a few strokes of a brush. I love it! 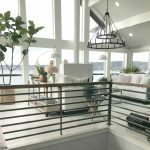 Let’s face it…there are not too many ways to give a space a brand new look for such a relatively small investment of time and money. A can of paint, a few supplies and an afternoon can leave you feeling like a magician! I also love adventure. I’ve run marathons, hiked mountains, taken my bike on a solo 10-day ride through the Colorado Rocky Mountains. I’ve lived in countries like Morocco, Turkey and Mexico as a single women and felt myself fearless at times (more about that later)! But…..I have never mixed the two! Until now. Read how some FREE paint samples and a trip to my local Dunn-Edwards Paint Store changed all that! Here is my story…. I was feeling bored (story of my decorating life). Last year I painted nearly my whole house a very, very light cool gray and loved how it lightened and brightened up the whole house. I still love it. But I was craving some WOW in my decorating. Specifically, I was feeling rather dissatisfied with my dining room. In spite of my redecorating efforts over the past year, which involved swapping out all the wall decor several times, I still wasn’t happy. It was dull and well….uninspired. Honestly, I had visions of getting rid of all my furniture as a last ditch effort to bring new life to this space. However, as most of you know, this type of drastic action does not fit my budget constraints, so I was frustrated. I’m not sure how or when I actually came up with the brilliant idea to paint. (It probably wasn’t mine…it was probably Julie’s…haha, she added that!!) But once I did, ideas started forming quickly and wildly!! I started imagining all sorts of different scenarios and color options. I figured, if I was going to really go for it I needed to think outside the box (read: outside my light and bright-obsessed box) and look for other types of BOLD inspiration. It was late at night. The house was quite. But my brain was in high gear. (Obviously not sleep conducive!) 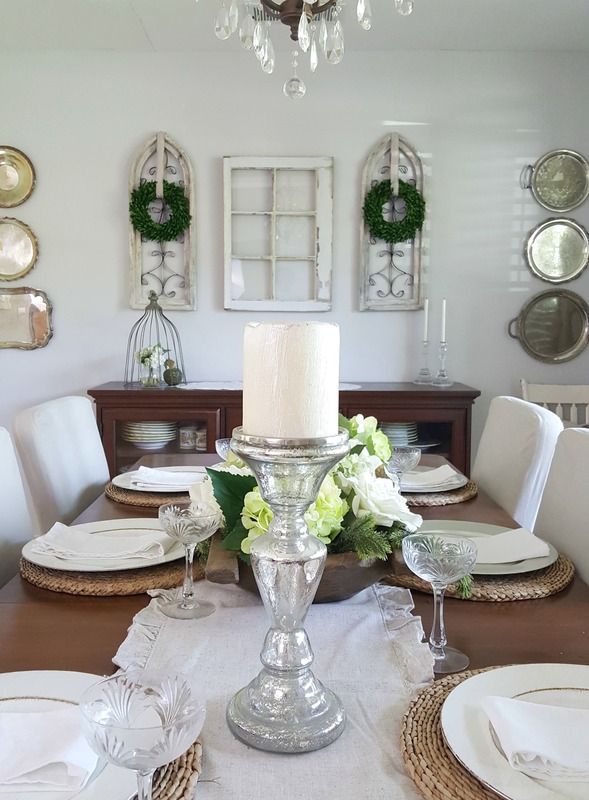 I was so excited I didn’t care… The part I enjoy most about decorating is the DREAMING part….opening up all the possibilities and telling myself ANYTHING is possible. It’s so much fun. It’s kinda like flying….and it’s where some of my best ideas come from. I actually started looking around my room…then from room to room looking for color inspiration. 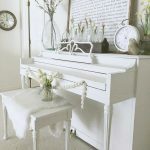 I am a neutral girl at heart but a recurring theme started to emerge as I picked up a few of my favorite decor pieces. 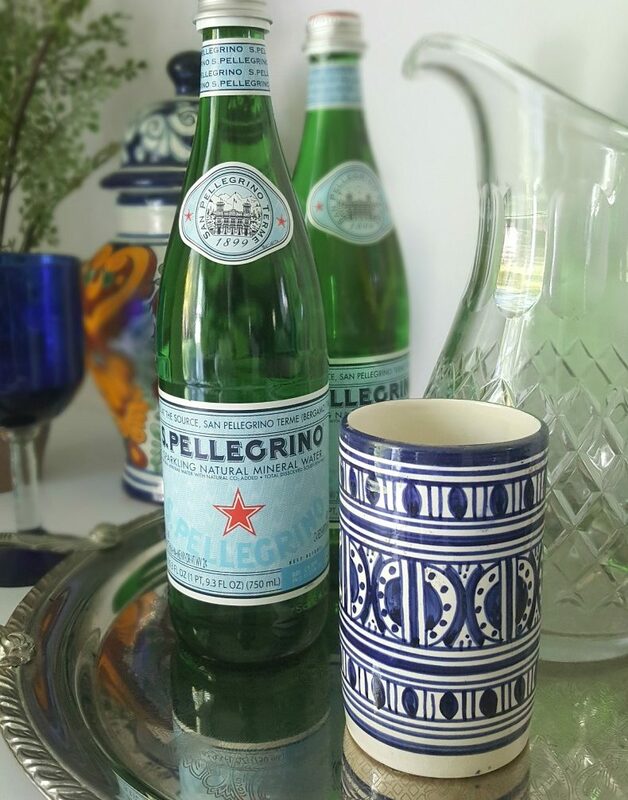 The navy blue of the traditional Fesi pottery is full of memories and inspiration for me. (I lived in Fes, Morocco for two years as a teacher when I was in my late 20’s, but that’s a LONG story I’ll save for another time!) 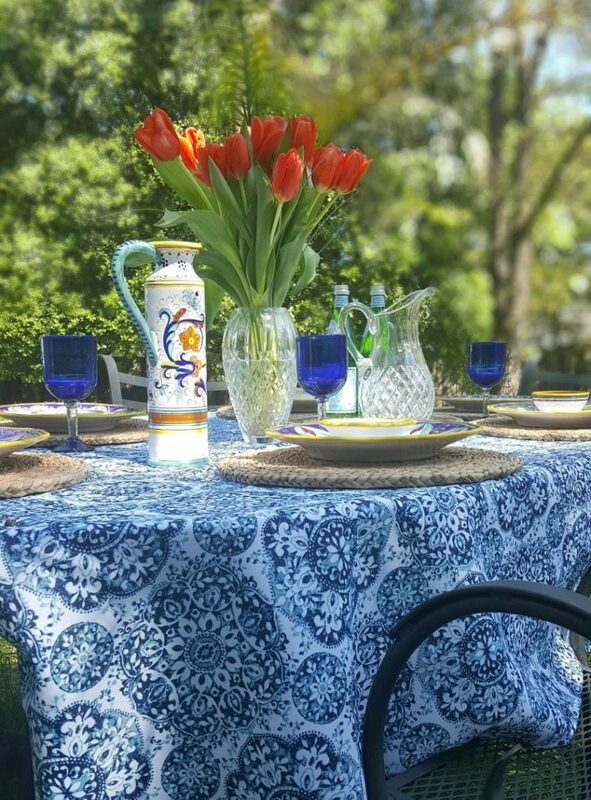 The cobalt blue of the hand-blown glasses from Puebla, Mexico and the hand-painted pottery from Italy are also rich with memories of my year spent in Oaxaca as a teacher and my honeymoon spent in Tuscany. These memories conjured up deep personal feelings of adventure and personal growth for me so these colors really speak to me! This was a great place for me to start. Next, I turned to the experts at Dunn-Edwards. 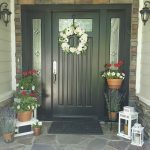 Their website www.dunnedwards.com is full of ideas, inspiration, tools and advice that are free and available 24/7! Using the Dunn-Edwards InstaColor on-line tool, I easily uploaded a picture of my dining room and started playing with color. Starting with my inspiration colors (shades of blue between cobalt and navy) I was able to use this tool to identify a few paint possibilities. This tool also helped me begin to see how the color would work with the existing elements in the room (ie. the existing wall color of the surrounding walls and the furniture pieces that I knew I needed to work with). I also found the Dunn-Edwards “2017 Beyond Wild Imaginations” report all about current cultural and design trends that are influencing art, fashion and well…color in every part of our lives. It was fascinating and definitely got my creative juices flowing. I was off and running! Literally! I headed to my local Dunn-Edwards store the next morning to turn my inspiration into a reality and brought along a couple of things. Upon arrival at the store I was greeted by a welcoming staff of professionals that helped me every inch of the way. I was wishy-washy and undecided…Ok, scared is more accurate. But they were full of ideas, helpful suggestions and more than anything…..patience. Within less than an hour I was out the door headed home with my FREE paint samples and the confidence that one or both of them was going to help me create the room I was dreaming of! Look for color inspiration in YOUR life. What colors are you naturally drawn to? What are some of the favorite pieces of art or items that you have collected over the years? Even if you have never considered painting with these colors choosing a color palette that speaks to your heart is a great place to start. Consider the space you will be painting. What are the colors that already exist in the room? 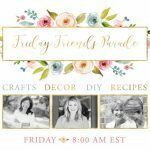 What are the pieces of furniture that you need to work with? These need to be considered when deciding your color choice. How colors play off each other is an important piece of the puzzle. 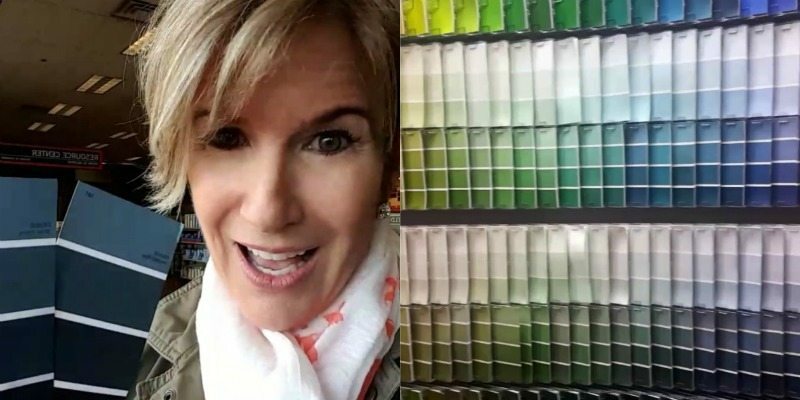 This is where a professional color consultant can really help! If you’re still not sure, apply several paint samples to your wall before you commit. (Click here for a coupon for your FREE SAMPLE.) Paint is just paint. You can always go over it. But it is still a commitment of time and money so if you’re not sure do yourself a favor and put a small amount on the wall before painting the whole wall. Let it dry, watch your samples throughout the various hours of the day, and get a feel for the color(s). My final color choice? Dunn-Edwards “Deepest Sea” – DE 5825. 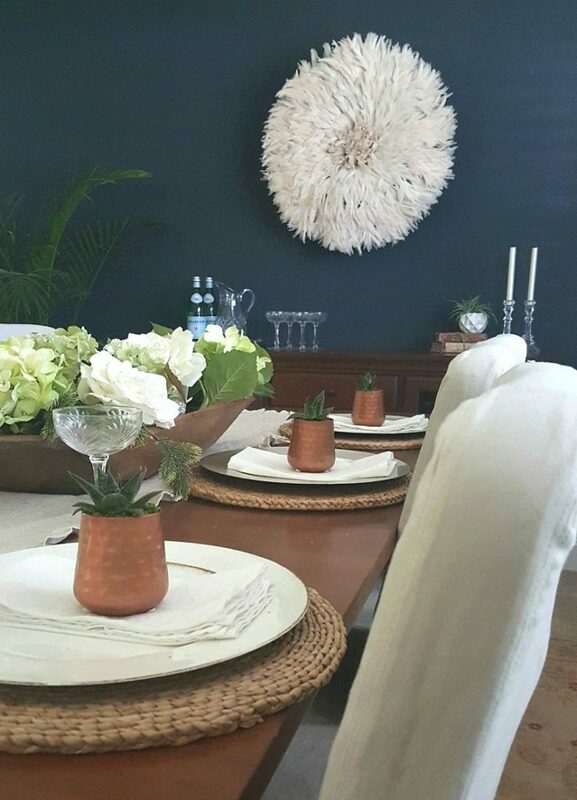 I chose their Ultra Premium Interior Flat Paint, Everest because of my textured walls. It covered easily in one coat. I put on a second coat just to be sure! I couldn’t be more excited about my BOLD color choice! Thanks to the color experts at Dunn-Edwards I was able to turn my color inspiration into a reality. Now when I walk down the hall instead of visually skipping past my dining room I stop and stare. The bold navy color SPEAKS to me! It makes me feel brave and confident….powerful and courageous! Just like I did when I was a young, fearless 20-something traveling to Morocco. Now I feel unstop-able. Like I can do anything! The room now feels interesting and intriguing. The color conjures up feelings of excitement and new possibilities for this space. The navy feels timeless, classic and almost regal. It adds a new level of style and sophistication to the room that I didn’t believe possible. The color has also inspired my decor. It has opened up a brand new world of decor possibilities for this room and has quite literally changed how I feel about my entire home. Suddenly I feel more confident. More stylish. More worldly. Hmm….maybe that is just my younger self feeling more at home! Taking time to connect with the colors that really mean something to me personally and evoke a strong emotional reaction made all the difference! Want to feel empowered? You are just a paint can away!! WOW it’s amazing what a difference just a little paint can make. JUST PERFECT ❤❤❤ MANY BLESSINGS. Go Jodie! I’ve been on a blue obsession that just increases when I see your gorgeous blue wall! Love you both! March Madness! The room has a bold sophistication now! Like a traditional navy suit…. can’t wait to see what “jewelry” you add to the room. Nicely done! Love it!!! Navy is my new favorite color!!!???????? Opps forgot– march Madness ???? I want to hear more about your fearless 20s! You have had so many adventures and it is amazing to hear about them. 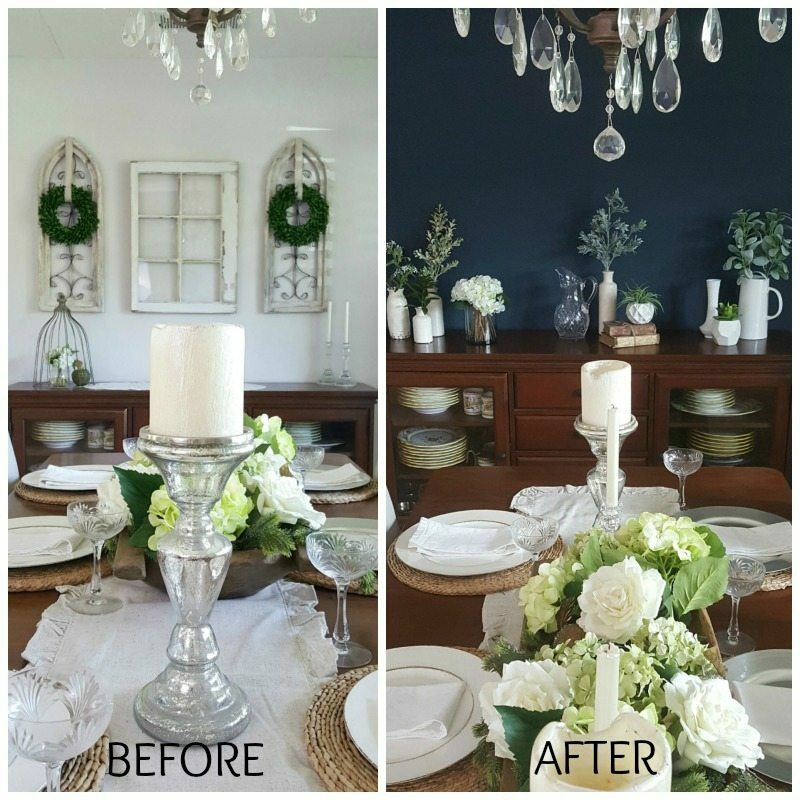 The paint color you chose is bold and beautiful and truly transformed your dining room! Gorgeous!! Love the color! March Madness!???????? 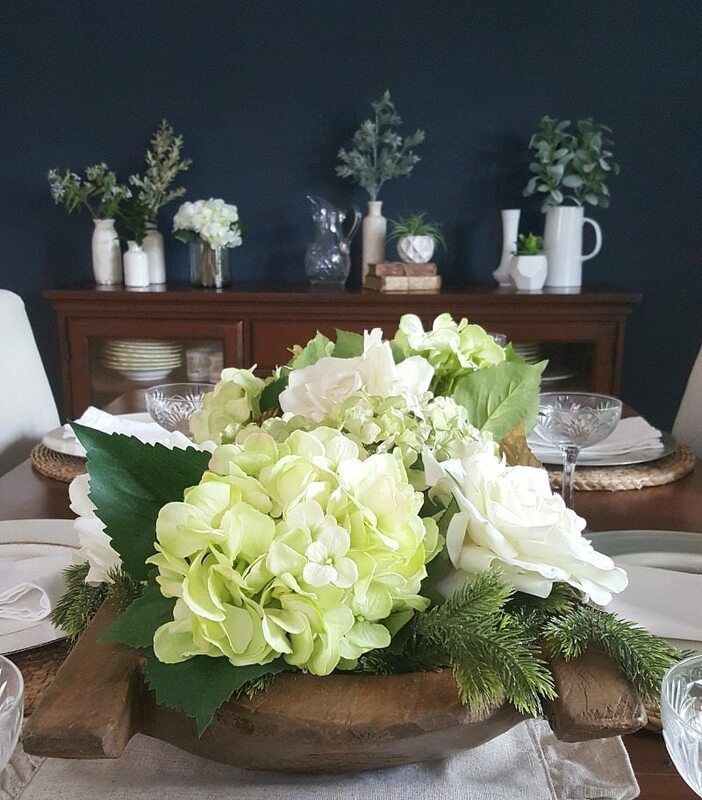 LOVE your beautiful new color in your dining room! Thanks so much for the informative blog! March Madness!???????????????? Beautiful!! I love the transformation. Your accent wall is absolutely gorgeous!!! March Madness!!!!!!!! Jodie, it’s GORGEOUS! What a huge difference and the dimension it adds. It changes the whole look of the room and how elegant! Beautiful choice. March Madness lives on!! 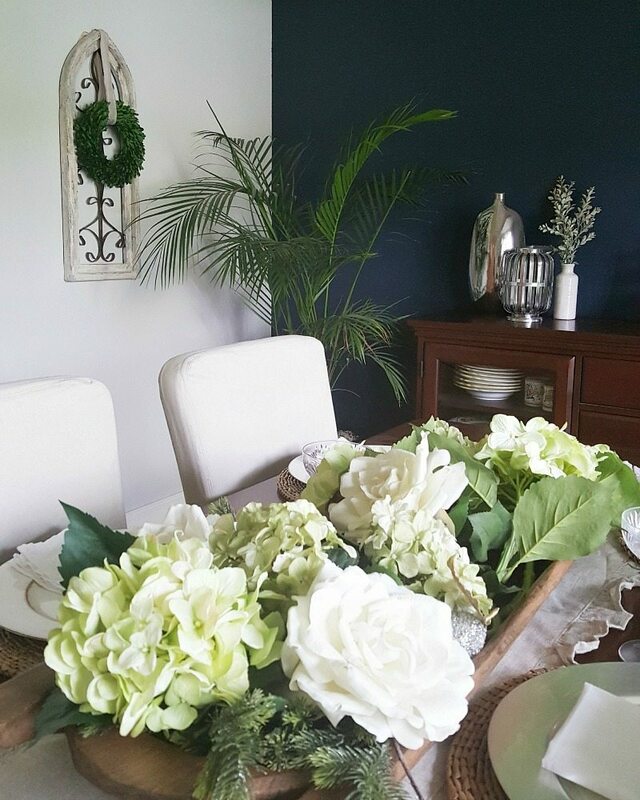 Love experimenting with different colors in the house…..especially paint colors! Your home is just beautiful! Enjoy! I love the blue wall. After seeing how beautiful it looked on your instagram, I am really considering doing something similar in my bedroom. Thank you! I just adore navy! 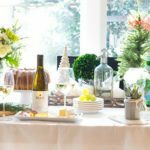 Your dining room looks fabulous! Also, I’m getting ready to make a big change in my own house with paint – and this post actually calmed my fears a bit. Thanks for the inspiration! Gorgeous statement wall! Such a bold rich color but still goes with so many other colors as well! I love it! ???????????? Your style is truly impeccable! You ladies are such an inspiration. ❤️ Last day for #marchmadness ???? I admire your bravery with such a rich color. I just recently had a house built. It’s MY first home, I definitely went the safe route with a greige color in the main living space and a light grey for the bedrooms. I’m always a little disappointed with paint, it always seems lighter than I thought. Hmmmm, let’s see, would you be putting plates on the wall or a beautiful floral painting?? Can’t wait to see what you come up with. Oh you sweet wild woman! I find myself falling in love more with each passing day! 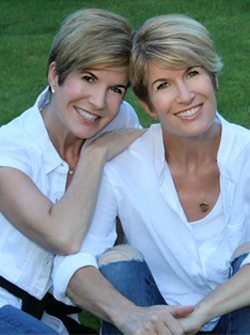 You and Julie have changed my life…but each in you own individual style, your twintouch, your tiny adorableness and yes, your adventurous spirits and boldness!!! Jodie, I’m so excited about this room, your inspiration pieces(much the same as mine)! But I’m stuck and not moving forward after moving from the home I raised my family in for 35 years to a new home very close to my duaghter and son-in-law who have my five treasured grandsons (The last two of whom are TWINS????) Jodie…good golly, I think you may have pushed me into the deep end! I love everything about this room…and have budget constraints of my own right now. HOw life changing your painting adventure and explanation of your thought process has been for this lady in Texas! Forever indebted and follower for life!!! Be blessed and keep shining! Love the bold dark color! Really complements the dark furnishings nicely, Well-done! I can’t tell you how much I LOVE that dark bold wall. So much so that I bought paint a couple months ago (yes i’m a procrastinator, I still haven’t painted) to do my bedroom that’s a greyish blue (BM Silver Gray 2131-60) which I thought would be BOLD compared to what I have now. My bedroom walls are currently a very light cream (kind of BM Woodlawn Snow) so going with the Silver Gray paint was a big step lol. Once I saw your dining room reveal though, I grabbed my paint swatch and have decided to paint the headboard wall Smokestack Gray which is a couple colours darker on the same paint card. We don’t have Dunn Edwards paint up here but I wish we did because a colour consultation would be great. WOW, love the navy! And great steps on how you arrived at your color! Can’t wait to see the decor you put up behind the china cupboard! March Madness! 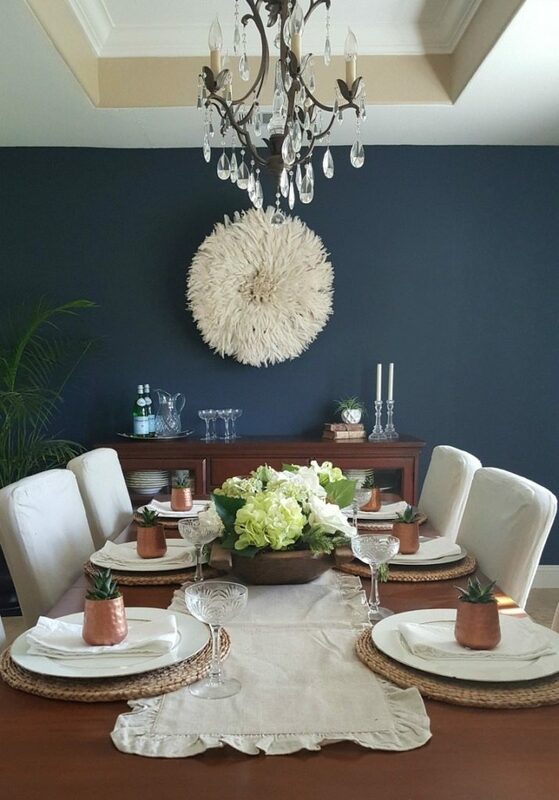 Wow love the blue so classy in your awesome home….thanks for sharing…I’m thinking about one wall for in my dining room. Right now I have a red room and it’s time for update..March Madness….this has been fun. I am in love with how your dinning Room came out. You did an amazing job. It is seriously gorgeous!!!! I did the same thing. It all stared with a new bed. I purchased a grey tufted headboard. I had the walls painted castle path, ( I love that color) something was missing and I just wasn’t happy. The colors in my room are, grey, navy and ivory. I did an accent wall behind the headboard in a navy and the whole room popped. I love it!! 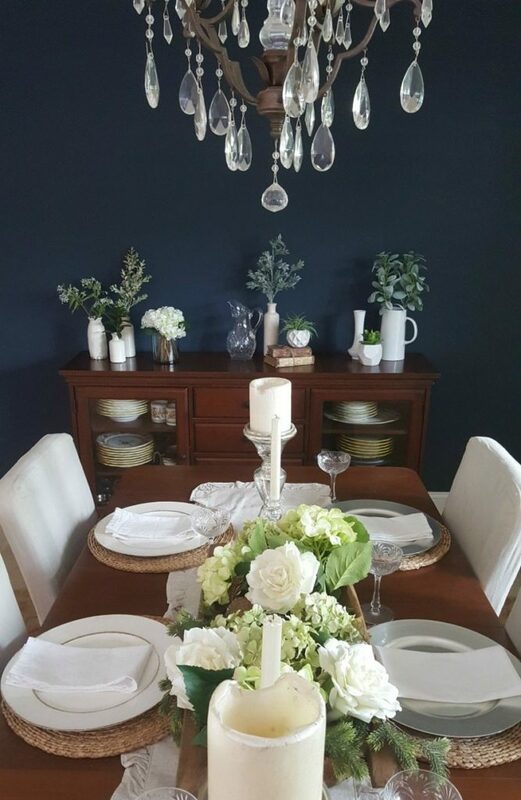 Love your dinning room, color choice and your new dinning room set. ???? A beautiful ending to March Madness!!! Love the color!!! Thank you ladies SO much for doing this amazing and so very generous giveaway all month!! It has been so fun reading your blog everyday and commenting with a chance to win. March Madness was the best! Y’all are the best! Such a great post! Love to hear your process on choosing your color! It was so much fun to bounce ideas off each other and I love all your encouragement. Your dining room is now going to inspire all parts of your home which is super exciting! I love your style. It’s been a great month for March Madness. Thank you ???? OMG I am obsessed. I am literally obsessing over the room- that blue is incredible. I love how deep and dark it is and what a pop of color it brings. Stunning! very beautiful, colorful pics. I loved All. While selecting color, color combination matters a lot.